The Bay Area has been bombarded by football festivities. As downtown San Francisco plays host to Super Bowl City — a promotional village for fans to enjoy the spectacle’s 50th anniversary — Bay Area locals rage against the pageantry of the week-long event, Alicia Keys and OneRepublic play free concerts, and a giant football sculpture made of Bud Light beer cans has been erected for boozed-up revelers to worship like some sort of holy monument to sport. Five decades ago, Super Bowl I was held on January 15, 1967 in Los Angeles, one day before San Francisco’s counterculture activist event Human Be-In, which preceded the city’s “Summer of Love.” In the 1960s, San Francisco was grappling against the norms of societal expectations, fighting for personal expression, and testing the electric Kool-Aid. Playland still existed on Ocean Beach, Sutro Baths was nestled on the shore next to The Cliff House, and cable cars ran the streets. So join us as we celebrate Super Bowl 50 by taking an historic look back at the host city as it appeared during the dawn of the Super Bowl era. 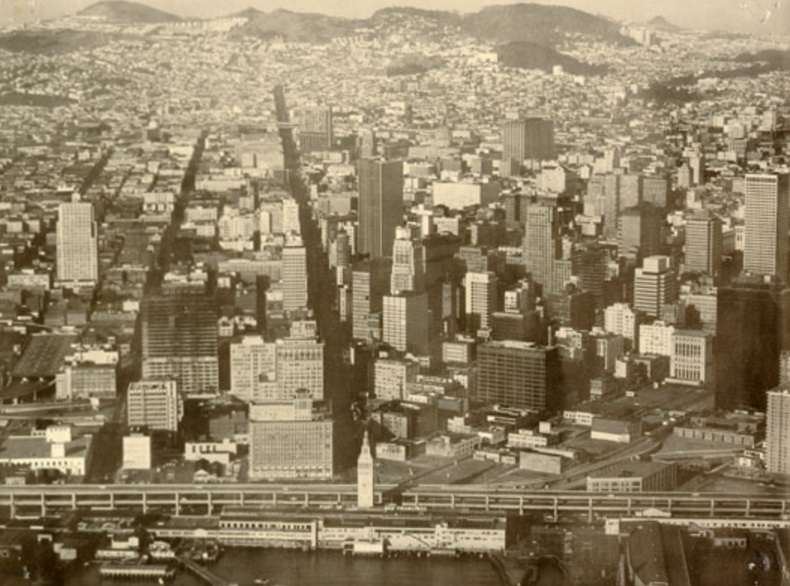 Aerial view of San Francisco looking west up Market Street, date unknown. The San Francisco skyline sans the Transamerica Pyramid, which wasn’t built until 1972. Playland at the Beach, ca. 1960. 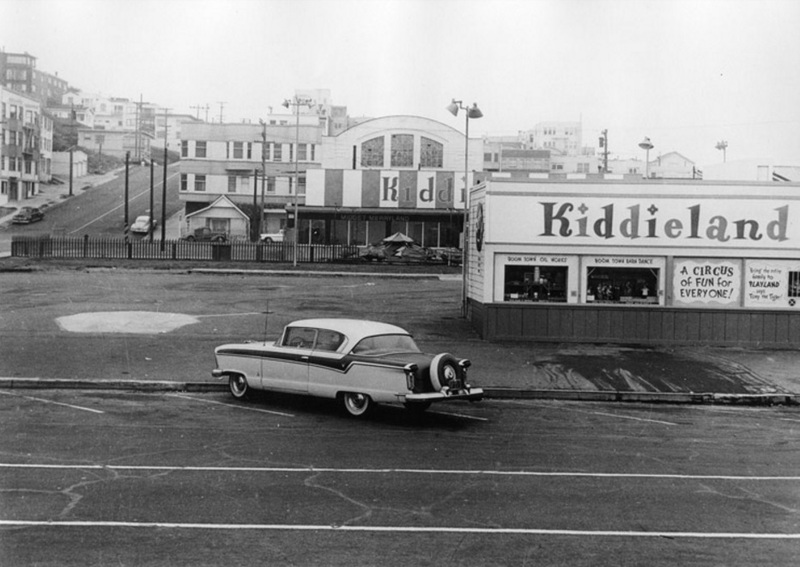 The seaside amusement park used to be alongside Outer Richmond, but closed in 1972. Lavish Sutro Baths viewed from Sutro Heights, ca. 1965. 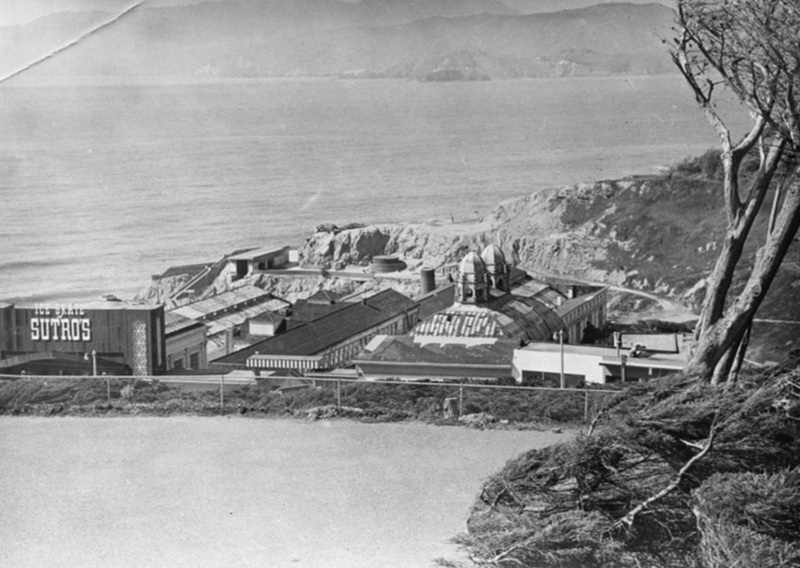 Arsonry burned down the Sutro Baths in late 1967, but before that it was one of the largest indoor swimming pools in the country. It contained 517 private dressing rooms, six saltwater pools a freshwater pool, and an ice skating rink. 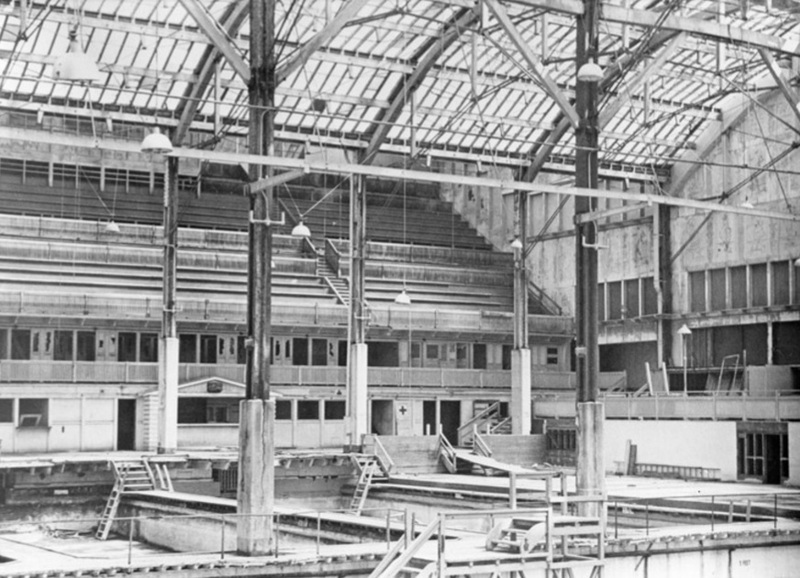 Inside look at Sutro Baths swimming pools and bleachers, ca. 1965. To get across the largest pool, people would use canoes. 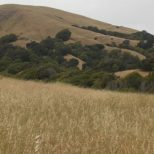 Now you can still see the ruins of the Sutro Baths when adventuring through Land’s Park. 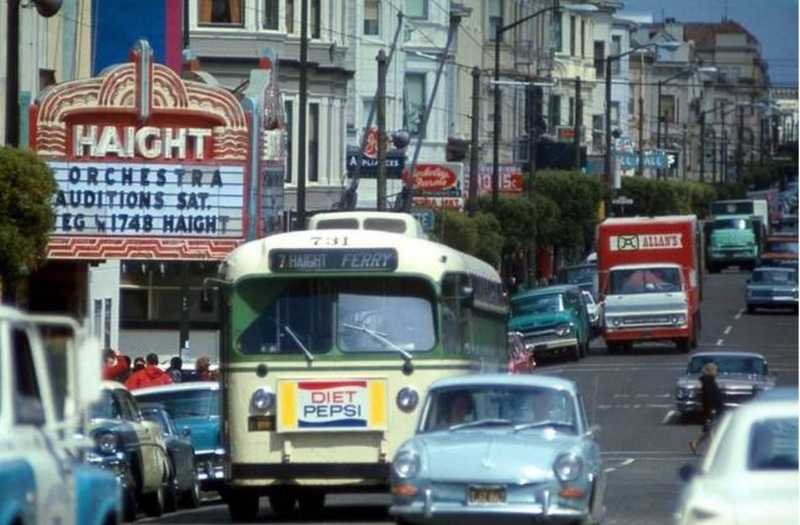 Haight Theatre on Haight Street, ca. 1967. 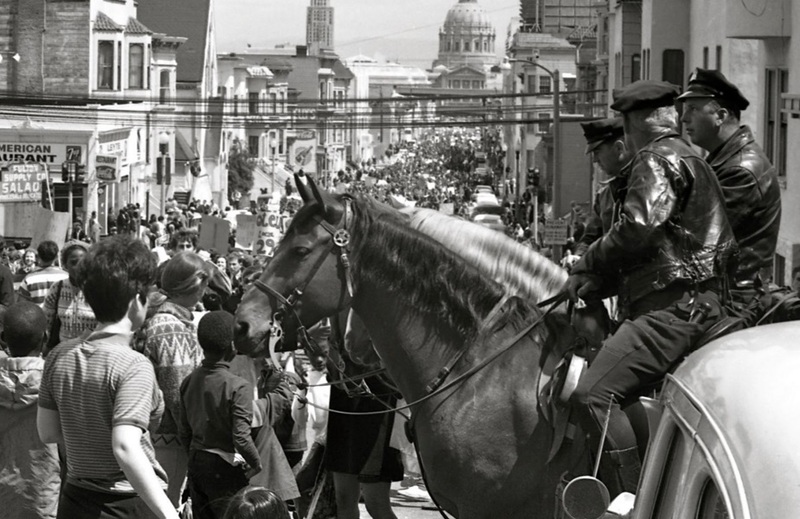 Mounted policemen monitor a protest march, April 15th, 1967. With San Francisco’s City Hall in the background, the counter-cultural movement collides with civic law. 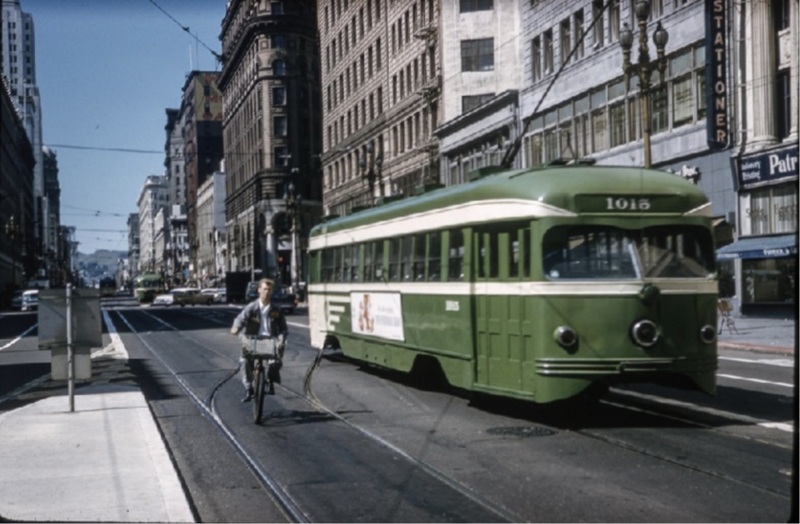 Looking West toward Montgomery with a streetcar MUNI 1015, ca. 1961. In 2016, cable cars primarily run as tourist attractions. But in the 1960s it was a viable mode of public transportation, although let’s hope less rickety. If you’re keen to take a ride down memory, be sure not to hop on Eddie Izzard’s Alcatraz car. 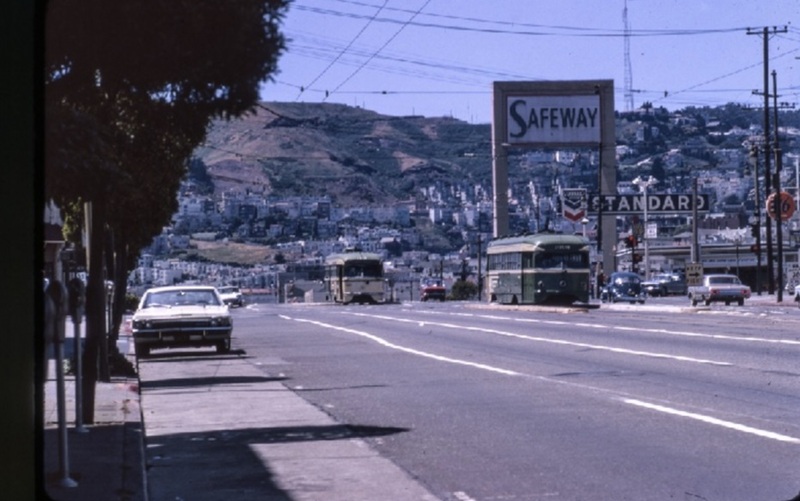 View of Safeway on Market Street near Castro, May 1966. Constructed in 1926, you can still pick up groceries at this same Safeway. 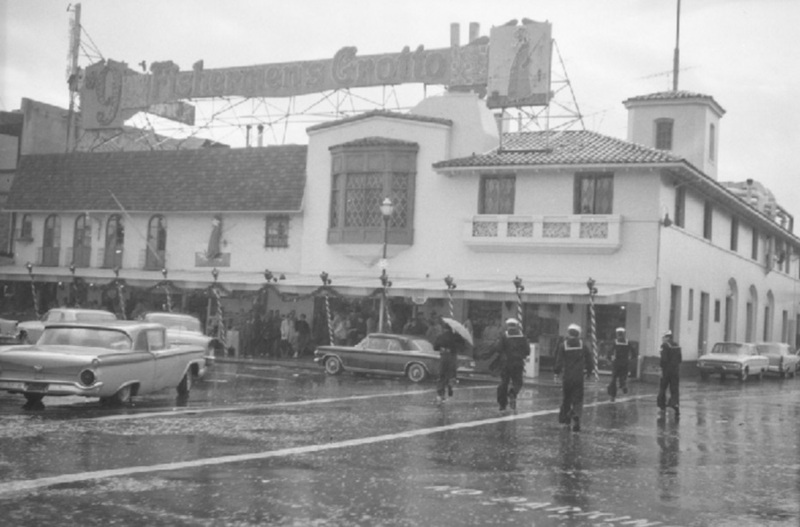 Four sailors run for cover from the rain, ca 1966. Fishermen’s Grotto on Taylor Street, constructed in 1935, is still in operation where you can pick up notoriously overpriced seafood. Streetcar entering Twin Peaks Tunnel, ca. May 1966. 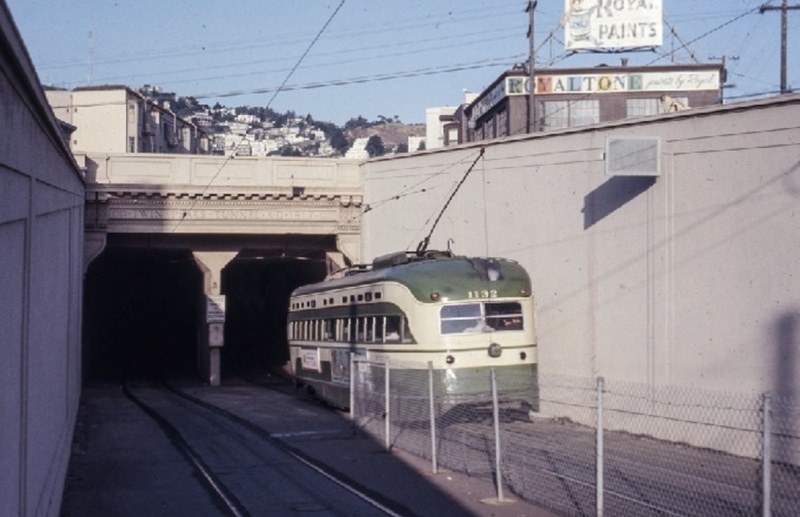 Opened in 1918, the Twin Peaks Tunnel is reported to be one of the world’s longest streetcar or light-rail tunnels. Still in working condition at the time this photo was take was the Eureka Valley Station, a nearby MUNI station abandoned in 1972. You can still catch a glimpse of the station’s ruins if you don’t blink. 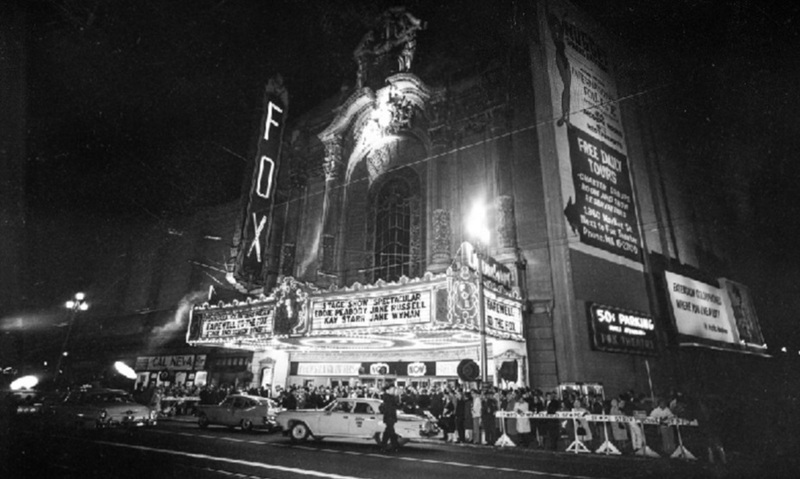 Last day and final showing of San Francisco’s 4,500 capacity Fox Theatre, ca. 1963. Rife with financial instability since its opening in 1929, the movie theatre along Market Street was demolished in 1963. 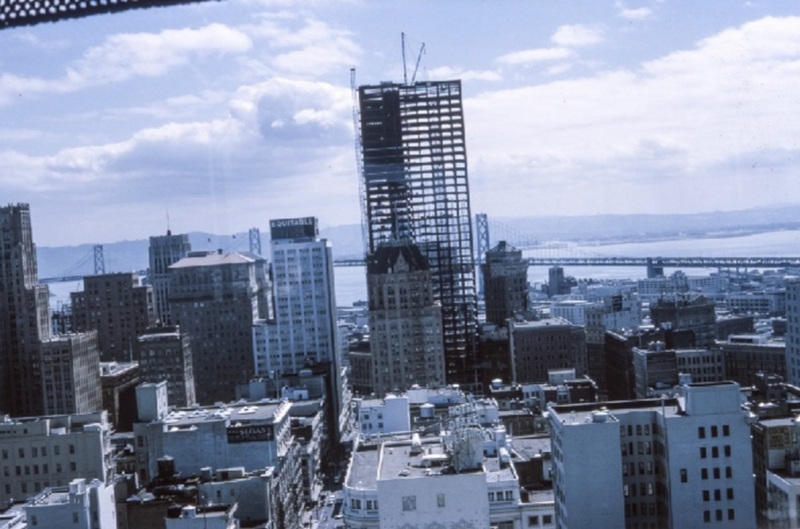 Construction of 44 Montgomery, ca. 1965. The 43-story skyscraper was the tallest building west of Dallas for two years until surpassed in 1969 by 555 California Street. Mission High students cross the street at the corner of Dolores Park, ca. 1965. 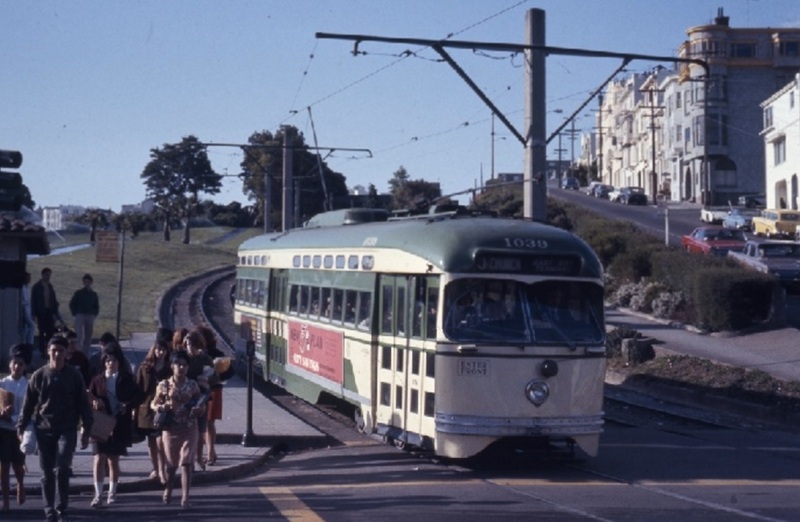 The J Church line still runs through 18th and Church Street, but is now a light-rail train. Police activity on Haight Street, ca. 1967. 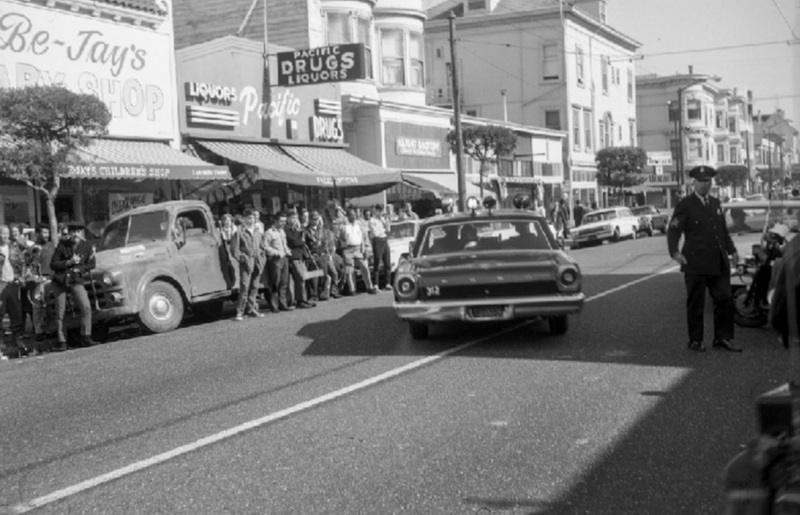 As many as 100,000 people visited Haight-Ashbury during 1967’s Summer of Love. The social experiment of hippies raised questions about sexual liberation, illicit drug use, and uninhibited creativity. Colombo Market Arch, ca. March 1967. 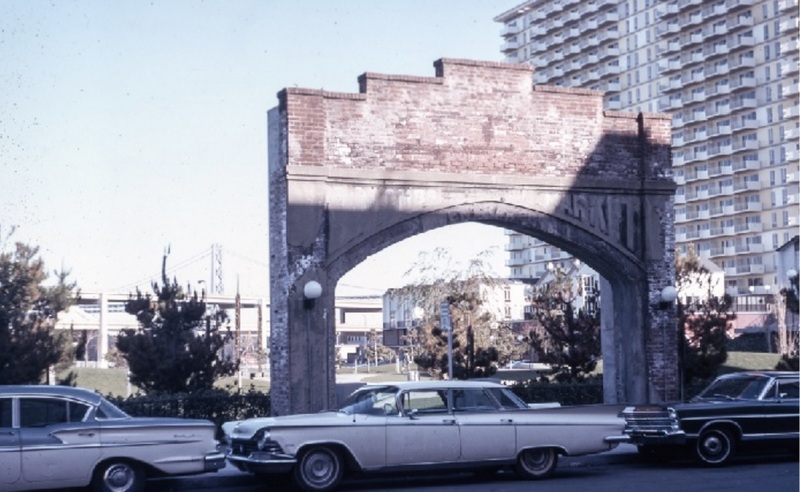 The arch is the only remaining structure from the city’s largest wholesale produce market, otherwise known as the produce district. 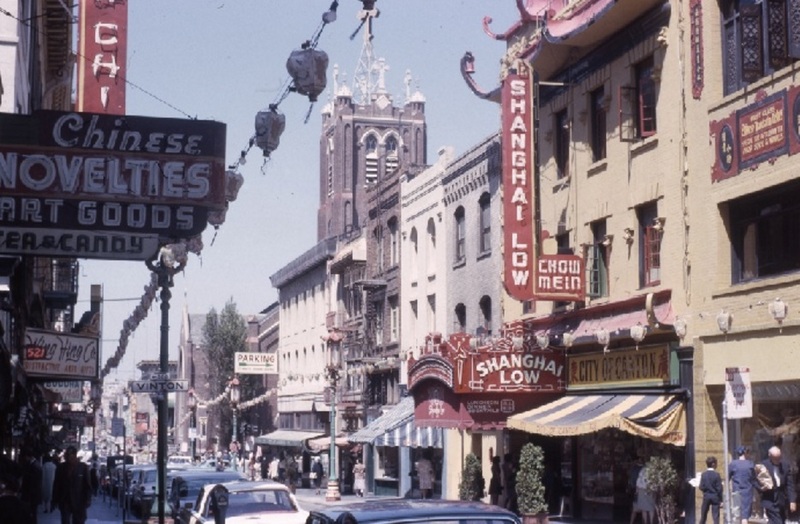 Old St. Mary’s Cathedral along Chinatown’s Grant Avenue, ca. August 1964. Old St. Mary’s Cathedral was the tallest building in California when erected in 1854. It survived the 1906 earthquake, but the fires caused by the earthquake ended up melting the church bells and marble altar.